Published Aug 31, 2014 by Peachpit Press. Part of the Learn by Video series. While capturing beautiful wedding portraits is a must for any wedding photographer, to be successful, you also need to be able to deliver photos to your clients in a timely manner. Not only is this a huge plus for the client, but it gives the photographer freedom to spend more time doing what they love—taking photos! And that is what photographers will learn from Khara Plicanic in Wedding Workflow for Photographers. In this video, Khara covers the basics of organizing the images you take, such as downloading, importing and backing up files, as well as how to integrate specially grouped images like those taken in photo booths. Next she discusses selecting and editing your images and exporting high-res proofs.With the basics covered, Khara dives into preparing all the deliverables that clients want—slideshows, blogs, albums, and online galleries—and shows how to package it all together for a convenient, easy experience for your client. 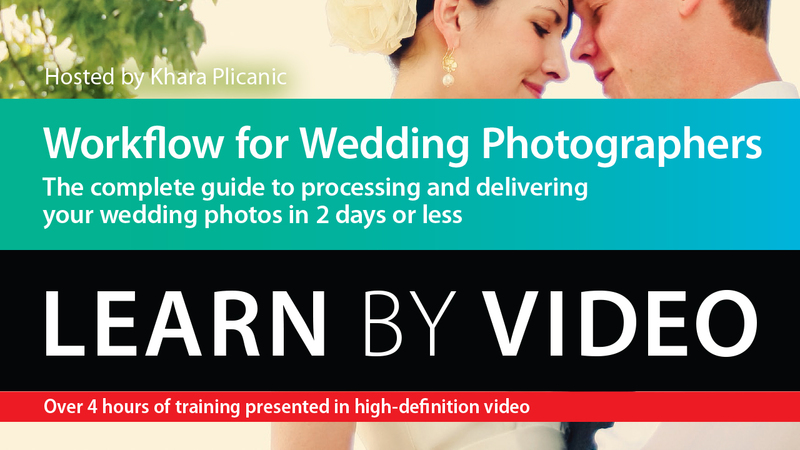 With a distinct approach developed throughout her career as a wedding photographer, Khara provides the necessary background and technical knowledge to understand how to process and deliver wedding photos, enabling the viewer to apply that knowledge to their own wedding photography experiences. Including 4 hours of video instruction, the video is wrapped in a unique interface that allows you to jump to any topic and also bookmark individual sections for later review. The popular “Watch and Work” mode shrinks the video into a small window to allow you to work alongside the instructors, practicing what you learn and reinforcing freshly gained knowledge.